Structure and function are correlated in the phloem of plants. 9.2 U 1 ​Plants transport organic compounds from sources to sinks. ​Translocation is the movement of organic compounds (e.g. sugars, amino acids) from sources to sinks. Organic molecules such as sucrose and amino acids move from a source to a sink via phloem tubes in plants. ​The phloem is composed of living tissue called sieve tube members (lack a nucleus) that are joined end to end to form a tube that conducts food materials throughout the plant. They are bordered by companion cells that carry out the cellular functions of a sieve-tube element. Phloem tubes can carry sugars and amino acids in a variety of directions; depending on where the source and the sinks are located (sometimes roots can be sources or sinks). Sources produce sugars by photosynthesis in leaves or green stems or by hydrolysis of starch in storage vessels (germinating seeds or roots/tubers) and deliver these products via the phloem to the sink (roots, buds, stem, seeds, and fruits). At the source, sugar and other organic molecules are loaded into the sieve tube members thus increasing solute concentration within the sieve tube cells (decreases water potential). 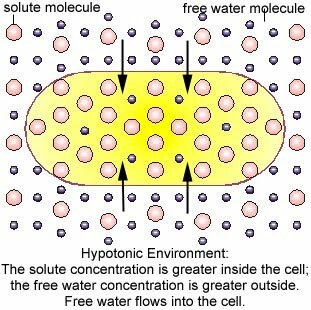 Water from surrounding tissues, enters the sieve tube members by osmosis following a concentration gradient.. The water absorbed into the sieve tube creates hydrostatic pressure that forces the phloem sap to flow (bulk flow) towards the sink. 9.2 U 2 ​Incompressibility of water allows transport along hydrostatic pressure gradients. At normal temperature, the compressibility of water is so low that it can be considered incompressible. Any change in pressure at one end of the transport vessel will result in an equal change in pressure at the other end of the transport vessel. This allows phloem sap to move up or down, with or against gravity, as it moves from source to sink. 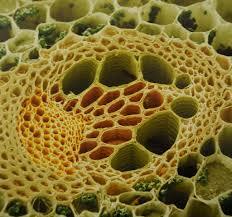 ​Organic compounds produced at the source are actively loaded into phloem sieve tubes by companion cells. Sugars are actively unloaded at the sink and water returns into the xylem tubes reinforcing the pressure gradient from the source to the sink. Water is recycled by the xylem, returning it from the sink back to the source. In some plants sugars travel through cell walls from mesophyll cells to cell walls of companion cells and some sieve cells. Sugar is then actively transported into the phloem by a sucrose transport protein (Apoplast Pathway). Protons are pumped out of the companion cells from the tissues by active transport, using ATP as an energy source. This creates a proton gradient. H+ binds with sucrose and flows back into the companion cell-sieve tube complex through a co-transport protein, following its concentration gradient, and pulling sucrose molecule with it into the cell. 9 2 U.5 ​Raised hydrostatic pressure causes the contents of the phloem to flow towards sinks. The proposes that water containing food molecules flows under pressure through the phloem. 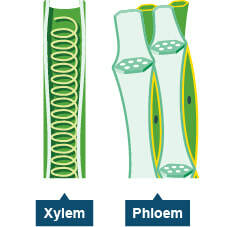 The pressure is created by the difference in water concentration of the solution in the phloem and the relatively pure water in the nearby xylem ducts. 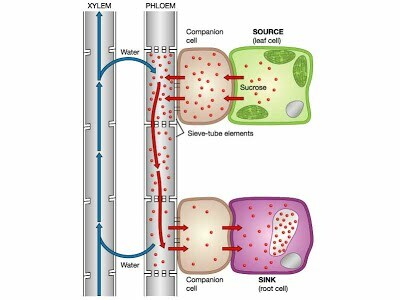 At their "source" — the leaves — sugars are pumped by active transport into the companion cells and sieve elements of the phloem. Turgor pressure builds up in the sieve elements (similar to the creation of root pressure). As the fluid is pushed down (and up) the phloem, sugars are removed by the cortex cells of both stem and root (the "sinks") and consumed or converted into starch. Starch is insoluble and exerts no osmotic effect. Therefore, the osmotic pressure of the contents of the phloem decreases. Finally, relatively pure water is left in the phloem, and this leaves by osmosis and/or is drawn back into nearby xylem vessels by the suction of transpiration-pull. 9.2 A 1 ​Structure–function relationships of phloem sieve tubes. Identify phloem within the vascular bundle of a stem and root. 9.2 S 2 Analysis of data from experiments measuring phloem transport rates using aphid stylets and radioactively-labelled carbon dioxide. ​State that aphids consume phloem sap as the main component of their diet. Aphid uses stylet to tap into phloem. The aphid body cut from stylet after stylet inserted into phloem. The phloem sap continues flowing through stylet. Analyse sap from solutes/carbohydrates. Plants are grown in radioactive CO2 which becomes incorporated into carbohydrates produced by plant. Radioactive-labeled carbon can be detected in the phloem sap. Stylets placed at different parts of the plant can show rate of movement of phloem sap. This animation covers plant transport, demonstrating how water travels through the plant, and how sugars are distributed around the plant. ​This video explains the pressure flow hypothesis, an explanation for how sugars are transported through the vascular tissue of a plant. ​This short film introduces aphids as ectoparasites that feed on the sugar rich phloem of plants.